Digital download available from janawinderen.bandcamp.com. Stereo version of multi-channel installation. Zooplankton and Phytoplankton are organisms which drift in the oceans, seas and bodies of fresh water. The word ‘zooplankton’ is derived from the Greek zoon (ζῴον), meaning ‘animal’, phyto is derived from the Greek words φυτόν (phyton), meaning plant and planktos (πλαγκτός), meaning wanderer or drifter. Mammals, fish and crustaceans feed on zooplankton and they in turn feed on phytoplankton. Phytoplankton need two things for photosynthesis and thus their survival: energy from the sun and nutrients from the water. In the process of photosynthesis, phytoplankton release oxygen into the water. Half of the world’s oxygen is produced by phytoplankton photosynthesis. Local abundance varies horizontally in the water column, vertically with ocean drifts and seasonally with the light. 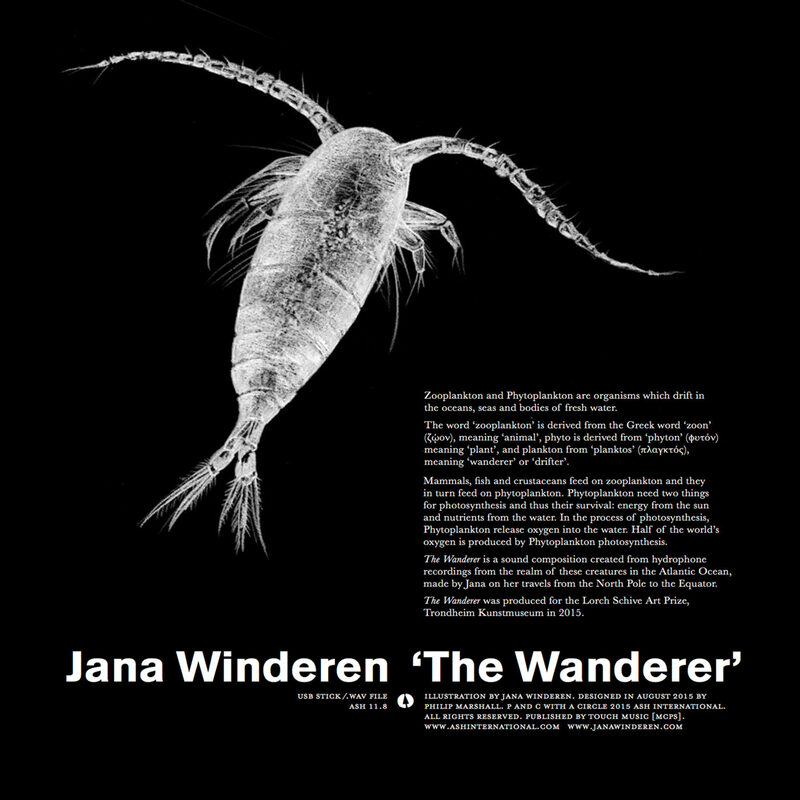 The Wanderer is a sound composition created from hydrophone recordings from the realm of these creatures in the Atlantic Ocean, made by Jana on her travels from the North Pole to the Equator. The Wanderer was produced for the Lorch Schive Art Prize, Trondheim Kunstmuseum in 2015. Originally released on a USB Stick in an edition of 50. It is not my wish to aggravate a poor reader by restating the biotic and ideological origins of The Wanderer in its different formats, for they’re readable all over the web. Let’s stress instead an unequivocal truth. Among a growing number of sound artists (and wannabes) who can afford the luxury of spending time by recording the voices of disparate environments, Jana Winderen belongs to the restricted group of individuals gifted enough in this field to be officially licensed as composers. And I’m not merely hinting at her technical grounds. It takes nothing but a decent sum of money to travel the world in search of glaciers, deserts and caves. And it takes a second to say “I’m enlightened” while looking at a sunrise in a valley. After all, everyone’s entitled to a few beliefs. However, understanding a work like this implies an innate tendency to consider everything happening as a component of an infinite score. That in which we, as mortals, are just a dot – significant or less, quite often much less – destined to become an eternal tacet. Perhaps this is the reason why people never cease to talk; becoming an eternal tacet is an aspiration whose highness is scary, and probably not desirable for many. But a human genuinely needs to recede from egotistical issues to grasp the extent of a piece where the invisible acoustic connotations of marine life take centre stage. In this particular instance, the luckiest receivers are those already acquainted with the sea’s intrinsic resonance. Not the water sloshing against the rocks, or the ebbing and flowing of a wave on the sand: those are still beauties, but in a way they’re available for the general public to poetically rant about. Winderen builds the compositional structure from within: detecting barely audible screeches and tiny screams, bringing forth minuscule polyrhythms, highlighting the restrained intensity of the aquatic counterpoint, generating unfathomable glissando chorales that smell of algae. In a word, allowing us to listen to the amazing richness of that fractal fermentation which is gradually being annihilated by clusters of insignificant dots obeying to the rules of a misconstrued tonality.